SO YOU THINK (NZ) (Bay or Brown 2006-Stud 2012). 14 wins-1 at 2, MVRC WS Cox P., Gr.1-twice. Sire of 380 rnrs, 213 wnrs, 15 SW, inc. La Bella Diosa (New Zealand One Thousand Guineas, Gr.1), Nakeeta Jane, Sopressa, D'Argento, Inference, Gold Rush, Heavenly Thought, Higher Ground, Think Bleue, The Pinnacle, Northwest Passage, Global Thinking, Marathon Man, Care to Think, So Si Bon, SP Harvestfortheworld, Light Up the Room, Coral Coast, etc. COSMIC ENDEAVOUR (f. by Northern Meteor). 7 wins-1 at 2-to 1400m, A$1,447,280, ATC Canterbury S., Gr.1, Qld Tatt's RC Tattersall's Tiara, Gr.1, ATC Sapphire S., Gr.2, BRC Dane Ripper S., Gr.2, Scone RC Inglis Guineas, RL, ATC Irresistible Pools & Spas H., Australian Turf Club 2YO P., 2d ATC PJ Bell S., Gr.3, Guy Walter S., Gr.3, 3d Hawkesbury RC Darley Crown, Gr.3, 4th ATC Triscay S., Gr.3, MVRC Champagne S., Gr.3, MRC Thoroughbred Club S., Gr.3, ATC Darby Munro S., L, BRC Hampden S., L.
Gamba (f. by Elusive Quality). 5 wins at 1000m, 1200m, A$88,805, ATC Canterbury Park H., Testa Rosa at Vinery H., 3d ATC West Tradies CFMEU Construction & General H.
Apollo (g. by So You Think). Winner. See below. Filipa (f. by Encosta de Lago). 2 wins at 1100m, 1200m in Aust. Crevettine (f. by Lonhro). Winner at 1200m in Aust. Phylicia (f. by Pierro). Placed in 2018-19 in Aust. FAIRY KING PRAWN (Danehill). Horse of the Year in Hong Kong in 1999-2000 & 2000-01. Champion Sprinter in Hong Kong in 1998-99, 1999-2000 & 2000-01. Champion Miler in Hong Kong in 1999-2000 & 2000-01. 12 wins-1 at 2-from 1000m to 1600m, HK$26,497,587, 97,864,000¥, 1,464,000Dhs, Tokyo Yasuda Kinen, Gr.1, Hong Kong Sprint, L, HKJC Stewards' Cup, L, Bauhinia Sprint Trophy, L, Chairman's Prize, L-twice, Happy Valley Trophy, L, National Day Cup, TVB Cup, Country Club Challenge Cup., Berlin H., 2d Hong Kong Mile, Gr.1, Nad al Sheba Dubai Duty Free S., Gr.2, HKJC Chairman's Prize, L, Sha Tin Vase, L, Centenary Cup, L, Bauhinia Sprint Trophy, L, National Panasonic Cup, Telecom Cup, Sprint Trial Trophy-twice. EASY ROCKING (Barathea). 5 wins-1 at 2-to 1200m, A$887,135, VRC Salinger S., Gr.1, AJC Challenge S., Gr.2, STC Canterbury S., Gr.2, AJC Kindergarten S., Gr.3, NSW Tatt's RC Roman Consul S., Gr.3, 2d BTC Doomben Ten Thousand S., Gr.1, AJC San Domenico S., Gr.2, Up & Coming S., Gr.2, Royal Sovereign S., Gr.2, VATC Caulfield Sprint H., Gr.2, AJC TJ Smith S., Gr.3, Leger H., 3d VRC Lightning S., Gr.1, AJC Stan Fox S., Gr.2. Sire. CREVETTE (Danehill). 4 wins. See above. ANISE (General Nediym). 2 wins at 2, A$325,220, ATC Kindergarten S., Gr.3, STC Asbestos Disease Foundation of Australia 2YO H., 2d ATC San Domenico S., Gr.3, Maurice McCarten S., L, Scone RC Ortensia S., L, ATC Clarry Conners 2YO P., MRC Le Pine Funerals H., 3d MRC Heath S., Gr.3, VRC Gucci S., L, GH Mumm S., L, 4th ATC Reisling S., Gr.2, Tea Rose S., Gr.2. MRS KIPLING (Exceed and Excel). 2 wins at 2, TRC Elwick S., L, 2d SAJC Breeders' S., Gr.3. Producer. ANA ROYALE (Anacheeva). 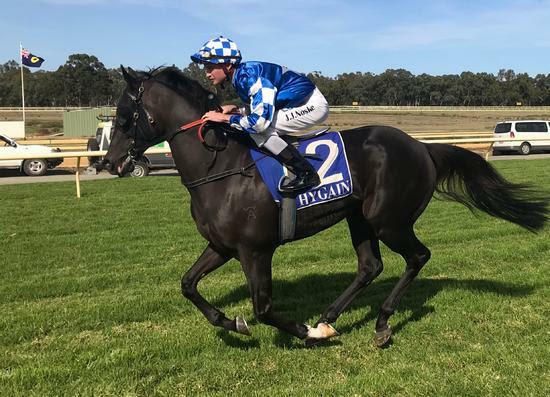 2 wins at 1400m, 2500m, A$281,620, SAJC South Australia Fillies Classic, Gr.3, 2d MVRC Jeep City Hawk H., 3d BRC Queensland Derby, Gr.1, SAJC Schweppes Oaks, Gr.1, MRC Vobis Gold Reef. Race Record: 23 Starts 1-3-7 A$38,705. Winner at 1300m in 2017-18, 2d WATC Fifth Leg H., 3d WATC Rentokil Initial H., Perthracing.com.au P.